There's a consensus among money writers that one of the most important first steps on the road to financial freedom is establishing an emergency fund. Your emergency fund is like self-insurance to protect you from all the small, surprise disasters we each encounter in daily life. But not every unexpected event is unwelcome. Sometimes life brings us lucky breaks — but these opportunities can still cost money. That's why I believe it makes sense to also keep a chunk of cash in an “opportunity fund”. I first learned about opportunity funds from reading about billionaires and business owners. These savvy savers often set aside money specifically to take advantage of unexpected opportunities. Your opportunity fund will start small. But as your financial situation improves, you can contribute more and more to the account. In time, your opportunity fund will become large enough that you can do some truly amazing things — like take time off for a round-the-world trip with your best friend, or quit your job to start your own business, or buy that classic car you've always wanted. 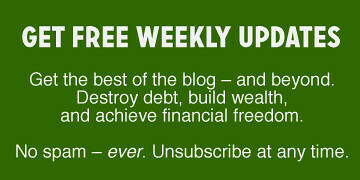 I've spoken with dozens of people who have achieved financial independence. These folks have accumulated enough capital that they're no longer compelled to work for an income (although some choose to work for other motives). Many have remarked that money hasn't bought them happiness; rather, it's bought them freedom. When an opportunity arises, they can afford to take advantage of the situation. This is an important point. Financial freedom isn't an absolute thing. It's not like you either have it or you don't. Financial freedom exists on a continuum. When you eliminate your debt, you increase your financial freedom. When you build emergency savings, you increase your financial freedom. When you boost your savings rate (whether by increasing income or decreasing expenses — or both), you increase your financial freedom. As you progress along the continuum of financial freedom from “enslaved by debt” to “financially independent,” you achieve certain milestones. For instance, you eventually reach a point where you have “Screw-It Money,” a cash cushion large enough that you could quit your job, if you wanted. When I was in debt, I felt like I was unlucky. I watched as my friends took trips to far away places, bought shiny new gadgets, or moved into bigger homes. I wondered why I couldn't have these things. Many times, a friend would come to me and ask if I wanted to join him for some sort of fun — dinner out, a basketball game, a trip around the world — and I'd have to decline because I couldn't afford it. I wasn't able to seize the opportunities that came my way because I didn't have the free cash to do so. Perhaps the biggest example from own life occurred twenty years ago. My friend Sparky had worked hard to save enough money to travel the world for several months. He asked if I wanted to join him for part of the trip. Of course, I wanted to — but I couldn't. I had no savings and was deep in debt. When I spotted a great deal on a last-minute Alaskan cruise, I was able to book a fun (and relatively cheap) vacation. When I found a deeply discounted display model at the local warehouse store, I was able to purchase a top-rated television at a bargain price. I was recently chatting with a friend about how Kim and I want to buy a cheap used pickup. “My father might have one for sale,” he said. We're exploring the idea. We couldn't do that without an opportunity fund. Over the past few years, I've discovered a handful of new businesses I believe in. I want to be a part of them. Because I keep money on hand to take advantage of opportunities, I now own 0.86% of The Financial Gym — among others. These are just a few of the many opportunities I've been able to enjoy because I have money ready to pay for unexpected positive events. Over the past five years, for instance, I've spoken with hundreds of people who have achieved financial independence. These folks have accumulated enough capital that they're no longer compelled to work for an income (although some choose to work for other motives). Many have remarked that money hasn't bought them happiness; rather, it's bought them freedom. When an opportunity arises, they have the freedom to take advantage of the situation. The bottom line: It's smart to set aside money in savings so that you're prepared for both emergencies and opportunities. There are 42 reader responses to "The opportunity fund: How to be prepared for lucky breaks". An opportunity fund sounds like great idea! And everyone can define themselves what these “opportunities” are. My husband and I have been putting money aside on a special holiday account for two years now, and we keep it separate from our other savings – it’s great to book tickets for a nice trip without it having an impact on our other savings/investment goals. The account used to be our wedding account, and the monthy savings helped to pay for our special day two years back. I am also right now going through my investment strategy, and I think I will start putting a certain amount aside each month for investments on a separate account, and when I see good opportunities in the stock market, for example, I’ll have some money to invest in them. I totally agree, and have been preaching that for quite a while. However, many people’s response is: where do I get that money? Every recession is preceded by a season of unusual bountifulness. Problem is most people don’t see it for that. They feel that it’s the “normal it should have been,” rather than an opportunity to stay frugal and save up an opportunity fund to pounce on those bargains which the very next season (recession) will inevitably bring. *THIS*. I am convinced that what others are calling an economic recovery (back to the Way Things Were/lots of jobs) is really a season of unusual bountifulness between the Great Recession and the Next Great Recession. I am doubling down our efforts to pay off debt before the season ends. LOVE the idea of an opportunity fund! Looking forward to transferring the $ that’s going towards debt repayment into that fund (sadly, it’ll be awhile, and yes, I do save, it’s just earmarked for other necessities). Agreed, William! I think now is the time to be an ant, not a grasshopper. Pay down what you can, save as much as possible, and don’t incur more debt. And here’s another thing about recessions: They are great sources of opportunities. In 2008 and 2009, I was surprised by the number of readers who sent me stories about taking advantage of sales on everything from televisions to houses. Some even called it “predatory shopping”, which I thought was bold. Basically, they kept an opportunity fund specifically for when the economy crashed. When it did, they took advantage of it. It’s very much like the “buy low, sell high” philosophy of investing, but applied to standard consumer spending. Opened my eyes! Really? What unusual bounteousness? I sure haven’t seen it, and a jobless “recovery” is not a recovery at all. If you are over 50, you can kiss any good opportunities goodbye. Ha ha, thank you! My husband (over 50) would agree with you! I like how you point out that financial freedom isn’t a set spot. Every little thing you do, either good or bad, gives you more or less financial freedom. Agree. I really liked the phrase “financial freedom continuum”. Mr PoP calls it “dry powder” and eagerly awaits finding the investment opportunities that make it worth breaking out a match and starting a fire with it. I’ve managed my own IRA through ETrade for about 10 years now. When I first started investing, anytime I sold a stock or fund, I’d immediately start looking for the next investment to roll the newly freed up funds into. Usually, I’d take anywhere from a 1 to 3 weeks, and choose what I felt was the best investment opportunity I could find and buy in. I discovered that if I could develop the discipline to keep that money sitting in the IRA as cash available for investment for months instead of weeks (an ‘opportunity fund’), I’d inevitably find a significantly more promising opportunity. The more disciplined you can be with what you have, the easier it becomes to turn that into something better. Thanks for putting a name to a concept I have thought about for some time. There will always be opportunities, business ideas or what ever that will need capital. It really hurts to miss an opportunity because you weren’t prepared. I really love this type of thinking. It’s an inspiring antithesis to the PF doomsday rhetoric of “EF! EF! EF! FIIIIRRRE”. I’ve decided to apply this method in my search for my next rental property. Originally the plan was to have seperate savings accounts for major upcoming expenses (school, 2 yrs planned unemployment, DP on rental, finish reno on current property…etc). But somewhere along the line I changed my mind about only looking for properties after I’ve saved close the amount I need for 30% down. If I limit myself to only a specific window of time and money I could be missing out on something that would workout better for me in the long run. Now that I’ve decided to merge all of my savings into a general account (or my opportunity fund) I find that I now have enough for 30% down on a property and can take my time looking NOW to see what is out there…knowing I can strike when I want to, and without the thinking of “well I can’t get it now, even though it’s perfect and fits my every need, because I don’t have enough in the rental DP fund”. And I don’t have to worry that when I do have enough in the designated DP fund and am ready to buy, the properties I wanted are not available or worse, I don’t want any of the ones that are available. Having a tangible goal for savings is motivational, but at the same time we can’t let it tunnel our vision to the point that we refuse to budge from our set path. Nobody can tell the future (as much as we all like to think we can) and if you assign a name to every dollar it could backfire. I think it’s good to have that open mind, to welcome in the universe for my new age-y peeps, with a “Come what may” attitude. I LOVE this idea. Somehow in my two years of reading financial literature, I haven’t come across anything like it, so thanks for the introduction. Opportunity here I come! I really like this concept in that it reasonably justifies the opportunity cost of keeping money in cash while it’s blighted by low interest and eaten away by inflation. The low returns are more than offset by the opportunities, which are the real payoff. People often forget this angle when looking at cash accounts! However, I have to ask– why keep it in CDs, which are subject to early withdrawal penalties, and not in a money market account, which is more liquid? (Not that the interest you’d lose is too much these days, but still.) Thoughts? I was wondering this, too, El Nerdo. As these opportunities are often unexpected and may require you to act somewhat quickly (such as getting a great deal on a trip), I’d think one should keep these funds in a general savings account. But then I had a thought: If you keep your money in a CD and know that you will have to pay fees, etc., for an early withdrawal, that will make you think twice before sinking money in an opportunity. You’ll make sure that the fees you’ll incur are worth it for the opportunity. I’m gonna play DA and say that an opportunity fund does not necessarily have to be all cash, or even mostly cash. I think for any opportunity, even the most awesomist one ever, you should take at least 5 banking business days to think it over before throwing down, which conveniently is usually how much it takes to sell some shares, or transfer from high-yields savings. Regarding CD’s, I think that they can successfully be incorporated in an opportunity fund scheme if you ladder them so that they mature every 6 months or so. Also, the funds from a CD wouldn’t need to go directly towards the opportunity in order to play a part in your decision to pursue that opportunity. Maybe this opportunity will cause you to deplete your liquid cash to a level you are not comfortable with, however you have a few CDs available that you know if you really needed to you could tap them if the opportunity doesn’t work out. So in this case the CDs provide the confidence to go forth and hopefully prosper. Thanks for the replies guys. My opportunities would be more of the kind that would require quick cash, such as used cars, appliances, free piles of bricks from Craigslist, etc.– not really looking to invest in a startup or purchase a home on cash. So it’s gonna be straight-up savings or money market for me, depending on rates. In that interview linked Cuban also proposes large/bulk purchases of non-perishables with 30-50% discounts as an investment with a great return (hurray toothbrush heads from Costco!). It’s right under the same question where he talks about cash being king, opportunities, etc. One caveat though (a big one)– I think cash as an opportunity fund works best when you have an entrepreneurial/DIY temperament (as Cuban or JD have). It’s not really “passive income” when you have to do your research and assume a measure of risk for your sudden opportunity. Me, I love the idea, but some people are going to prefer focusing on their jobs and socking everything away on index funds or similar alternatives. [responding to a question about his bank account balance] Yes and it’s more insane. I keep a lot of cash available for investments. Most people throw their money at investments trying to beat inflation or the market. I wait until somebody does something stupid and try to pounce. that is where the best deals are made. This isn’t a new concept, Buffet has been doing it forever. One needs to be able to identify opportunities. Most people tend to have areas that they think are opportunities or areas that they specialize in or focus on. Perhaps you area is housing or rentals. Also the focus is waiting for the next great crash vs being able to identify opportunities when they exist in various cycles in different types of markets. If you choose to have a narrow focus your opportunities windows will also be more limited. The alternative is educating yourself about different types of opportunities so you have more of them. Of course this takes more time and perhaps invites more risk but the reward can be greater as well. I find it best to test some of your theories prior to jumping in to different opportunities, although that requires years of patience as you may have to wait through cycles. What I have initiated is an opportunity analyzer of sorts by keeping track of opportunities that I have identified and seeing how they actually do through different cycles. This is more of a self-assessment for me to see if my skills in identifying an opportunity are actually up to snuff. I have found being able to identify multi-opportunities in different cycles will allow you to find good ones even in frothy markets and will allow you to spread your risk across multiple ventures. Of course I also index passively but I do this separately to take advantage potential of larger upsides. Yes, exactly. Warren Buffett is actually one of the people who inspired me to consider this concept. His entire investing philosophy is built around the opportunity fund (though on a much, much larger scale than any of us will ever manage). I always try to keep some cash around for when my husband stumbles upon one of his fantastic travel deals. When he found a flight + hotel + rental car deal for 5 days in Scotland for $2000 – that’s for both of us – I was sure glad I had the $2000. And we had 6 months to save up spending money for the trip. We’ve had several fantastic, memorable, and (relatively) inexpensive vacations this way. I keep what I’ve dubbed a “dream fund” which is basically an opportunity fund. It’s one of my sub accounts at ING/Cap One. I wanted money set aside for the day when my husband and I finally put our dreams into action. I still have too much in cash, though, and need to move some into an index fund. I also really like how you talked about the continuum. It’s nice to see it spelled out like that. I always feel like I’m reaching for the next level, but it’s nice to acknowledge how far I’ve made it along that continuum. Admittedly, we consistently use the Fun Fund twice per year for our anniversary dinner and our joint birthday week, but it’s also around for unexpected trip deals (that aren’t anticipated by our “Vacation Fund”… We have a lot of funds! ), unnecessary phone upgrades, electronics sales, etc. Having this fund is awesome. We put have a small automatic transfer each pay period, but we also throw any leftover money into it at the end of the month. It’s nice to have a plan for that leftover money instead of just celebrating it by blowing it on sushi every month. It’s also nice to essentially have two “emergency” funds– The real EF, for real, unavoidable emergencies, and the Fun Fund, for fun “urgent” purchases that we can be discerning toward. Great idea. Gives you incredible leverage not matter what the deal. Very timely. We can often get caught up on saving to pay off debt, but saving the a “future investment,” is also important. Here in Canada we are allowed a ‘Tax Free Savings Account’ which can be used for investment, interest collection etc. There is a cumulative $5500/year limit on it (so it is now a $26000 max contribution), but any money made within the account is tax exempt. Additionally, withdrawals are entirely flexible. If you take money out you can put it back in later with no penalty. Cash out incurs no penalty and no tax. When they created this thing I hated it, seeing it as a loophole for rich people to hide their money from taxes (which accumulates over time, after 20 years a person can have the earnings from $120K in investments. It is of little use to people with no money to save. That said, it is a very useful tool and I have not been using it enough. It would be a perfect place for an ‘opportunity’ fund. Additionally, if the opportunity is an investment, it could stay within the account and be tax exempt. I’ve got practically no cash right now, and now I’m thinking perhaps I should develop some dry powder as well. Everything seems go go go now. Who knows! Yes! Yes! Yes! Thank you for putting a name to this. Based on a lot of reading, I was feeling like a bit of an idiot for having such a fund in cash-equivalents (except when reading Buffet and Graham), but it’s been so useful! @Nick: I have been maxing out my TFSA to do exactly what you are suggesting. It’s wonderful to have a no-penalty, tax-sheltered account to use when opportunity knocks. I buy “on sale” when I shop for goods and services and do the same when it comes to investments. Why not have part of your assets available for the right opportunity?! Yep. I bought two old lady vehicles 3 years ago for $7800 cash and $7500 with a $3000 trade in and the rest cash. Two older cars with low miles under 50k each and both cars owned by 80 year old people. I could not do it if I did not have the funds on hand and the continue looking for deals. Love you examples of how the opportunities are fun. I was thinking more financially minded. I used my “opportunity fund” to prepay my 2018 taxes in December. This move is going to save me a few grand overall. Not bad just for having some savings and paying my bills a little bit earlier. It’s not clear that an “opportunity fund” is a long run winner; sure, if you focus on the seen benefits, it might appear to be, but you can’t ignore the unseen opportunity costs like what could be done with the money while it was sitting around. It’s an empirical claim whether this does or does not boost returns overall, but you’ve given no real evidence that it does. Plus, it’s not like you need cash to take advantage of opportunities, especially if you know how to plan ahead, have lines of credit, etc. With my example of an old lady car I had thousands saved up because of two kids in college and needing to come up with $25k and $27k in tuition. You don’t want that sort of money in something to go down drastically like the market. Plus where would you go if you had an emergency plumbing issue like the sewer line collapsing from your house and need to come up with $5k for that fix? Yep had that too and covered it no problem. All my friends would have said they would need a loan. My partner’s son needed a pickup for his growing collection of tools (he’s a journeyman plumber). He started looking through the newspaper want ads (remember those?) and found what an “old dude” pickup, i.e., one that hadn’t been driven very much and in fact was still under warranty. My partner offered to pay cash for the vehicle so his son wouldn’t have to take out a loan. Instead, he pays us back by the month. You know what they say: “Luck” is what happens when preparation meets opportunity. Since my partner has an opportunity fund, his son got lucky. Like Joe I consider most of the money in my bond funds as opportunity money. Whenever the stock market gets around to the inevitable correction, I hope to pounce. I’m in this boat too. It’s a nice place to be. In a wholly unrelated sort of opportunity fund, a friend on Monday announced an available spare ticket to see Hamilton in London next weekend — so thanks to last year’s unspent bonus and a very understanding boss, my wife was able to book a cheap flight for an unexpected four-day trip across the pond. “This is crazy but awesome!” she said. “This is freedom! Let’s keep saving half our income so we can retire at 50 and jump on more of these chances,” said I. My husband and I have a line called “Opportunity Fund” in our YNAB budget. The fund isn’t very big, alas, but we stash small windfalls there until we can figure out what to do with them. The Opportunity Fund is for potential income-making activities, like buying mutual fund shares, investing in real estate, or opening my husband’s consulting business. We have a separate line called “Slush Fund” for buying stuff on deep discount, like the vehicles and vacations mentioned above. 1.) Good income-making opportunities don’t come along that often, so funds tend to sit there. 2.) In the past, I’ve gotten impatient and paid off low-interest debt with it, which is why it never gets that big. Pretty cool idea. I’d argue, though, that between an opportunity fund and an emergency fund, the emergency fund is more important. But both are for unexpected expenses – one for unexpected problems, and the other for unexpected opportunities.